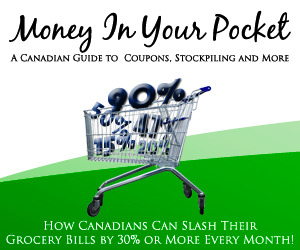 For those of you who are new to the coupon world in Canada, you’ll be excited to know that Cassie, from MrsJanuary.com has written a great 63 page ebook called Money in Your Pocket It’s the ultimate Canadian guide to coupons, stockpiling and more! Click here to visit Money In Your Pocket. I can guarantee, if you only put to use one of the tips available in the book you’ll start to see your grocery bill dwindle. But, once you’re armed with all the tips, and implement them all, you’ll start to see huge savings! The regular price of the book is $8.00, but for 48 hours only, it will be 50% off, making it only $4.00! After this time you can still get this ebook for only $8- packed with useful info to help you on your way to bigger savings! Thank you for helping to promote my eBook! It's worth telling others about!